The problem with living such a cushy life in America is that there's an impulse to pretend that most everyone else lives the same, or close to the same. To look hard at the face of injustice and abuse - especially toward children - threatens our own coziness, somehow. It's difficult to wrestle with the dichotomy of have/have not. It can't be tidied up and tucked away in a labeled box. It messes with my head. It kicks me in the gut when I should be sleeping. I can't make sense of my life juxtaposed with the lives of three little girls who live in a one room shack just a few miles down the street. Their existence complicates my bliss a little. It should. It's even harder to process the lives of children in third world countries. Their existence involves crippling poverty. Hunger. Slavery. Children. Slavery. I can't make it compute. Today, my children will wake up thrilled to the ends that Daddy has the day off. They'll argue over whether we go to the zoo or the mall. We'll pay for one meal what over half of the families in the world live on for a week. Across the ocean, in Ghana, Africa, mothers living impossible lives make the unthinkable decision to either sell their young children to someone who can provide for them, or watch them starve to death. They are told their children will be given food, housing, and an education. 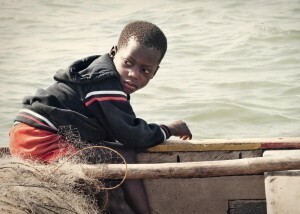 Instead, the kids are often taken to Lake Volta where they become child slaves. Their mothers never see them again. 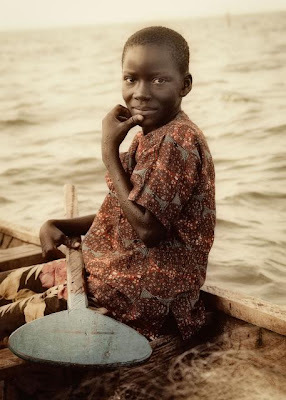 Thankfully, Mercy Project is working to break the cycles of trafficking around Lake Volta by providing alternate, more efficient, sustainable, fishing methods for villagers – ultimately eliminating the need for child slaves. Because of the work Mercy Project is doing in Ghana, the first group of children will be freed this month from Lake Volta. Calvin and I watched this video together a few weeks ago and it provided an amazing opportunity for him to see the way so many other children around the world are forced to live. I want my kiddos to understand from a young age that they are not the center of the Universe, that people are hurting all around, that they have a responsibility to help the helpless. 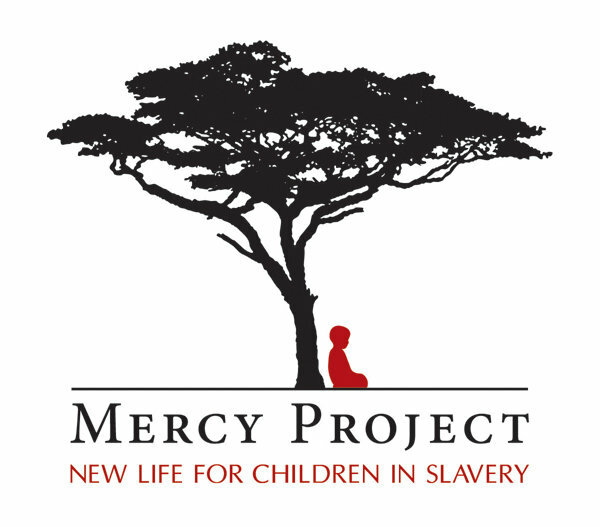 Today, as we celebrate the systems in our own country that strive to prevent injustices like child trafficking and child labor, let's remember the many child slaves around the world who are unprotected and the organizations, like Mercy Project, who are working to free them. Get involved by connecting with Mercy Project via Facebook, twitter, or their website. Help spread the word. And later this month, when they free their first group of children, we can celebrate together. Children in slavery breaks my heart. Freeing them makes my heart sing. Thank you Mercy Project. It really is unthinkable. It was said in my church yesterday that God cannot move us based on facts that we don't know. Thank you Shannan for sharing the facts!! Thank you Mercy Projects for getting in there and making a difference!!! This is horrible. I am glad there are people out there wanting to help. The first thing that hits my mind though is if it helps the fishing industry, when the children go home, are they actually profiting from it, or are they just going back home to a home with no food? Is there any more information on how it's actually helping the children's lives or just their owners? Hey Heather! You ask some great questions that I'd love to answer. Mercy Project realizes the situations that lead to child trafficking in any country are dire. Helping keep the children with their parents will take a three-pronged approach. 1. Creating job opportunities for the families (this will happen further down the road, but economic development is definitely Mercy Project's main strategy for combating child labor and child slavery in Ghana). 2. Mercy Project will pay for the kids returning home to go to school. If a family feels as though their child has a future, they are far less likely to re-traffic the children. 3. Mercy Project has an American married couple on staff who will help monitor the returned children as well as an on-staff Ghanian social worker who makes sure the children are remaining with their parents. In all of these ways, Mercy Project is hoping to address the root issues of why kids are being trafficked in Ghana. Thank you so much for the clarification! I read a little on the website but it wasn't completely clear. That's fantastic! So sad and awful. I think alot of people choose not to think of how others live. YOu have such a big heart. No wonder you don't sleep as you are trying to take care of so many people. When I pushed the contact button it woundn't allow me to contact you unless I set up and account. Sighhh. I just wanted to share a few things!http://www.ksl.com/?sid=21991451&nid=148&title=man-funds-makeshift-orphanage-through-woodcarvings&s_cid=featured-4 The above because you love "people...people who help people." Sung in the voice of Barbra Streisand. This: https://www.lds.org/general-conference/2008/10/lift-where-you-stand?lang=eng Because you lift where you stand and I admire it! oh friend. i love your heart. i love this post. i'm going to share it. and can we talk sometime? i think God is leading you and your husband in the same direction i feel he's leading us. i'd love to skype with you sometime. would this be possible? write me an email and let me know. thank you. Thanks for shedding light on The Mercy Project, Shannan, and the reminder of how uncomfortable our comfort should be in light of the injustice of child slavery and extreme poverty. Thank you for all the ways you DO SOMETHING and inspire others to do the same, because you listen to His voice and do the hard things. Sorry, *Mercy Project, not The Mercy Project.